P&R Locksmiths replacement Upvc and composite multi point locks. When choosing to replace the locks on your Upvc or composite doors, it’s very important to understand the new standards introduced to the industry in the last few years. Nearly all doors of this type use “Euro” type cylinders these are very vulnerable to forced entry via snapping the cylinder if they do not have features designed within them to defeat the form of attack. 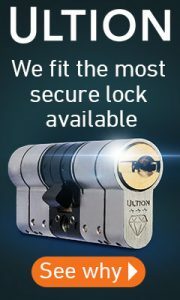 P&R Locksmiths always recommend Ultion locks. Ultion meets the highest TS007 standard (3 star) without needing to be bolstered with support of cylinder protectors or extra secure door handles. Sold Secure Diamond is a test developed in conjunction with The Master Locksmith Association. Test’s designed by locksmiths. The moment that Ultion detects forced entry it activates an attack lock directly into the central cam, this is ‘Lock Down Mode’. 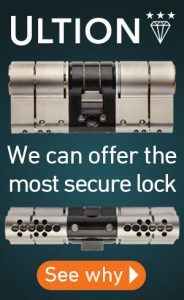 Even if the most determined intruder gets past Ultion’s two sacrificial sections he won’t get to the attack lock because it is protected deep inside a solid molybdenum core and secured with a dedicated retaining pin. When Ultion is in Lockdown Mode your home and family are safe. Molybdenum is used in high strength superalloys. Its sixth highest melting point of any alloy and ability to withstand pressures up to 300,000 pounds per square inch are why it features in the production of military air craft and housing the attack lock in Ultion. Don’t chance your security with anything less, fit Ultion.